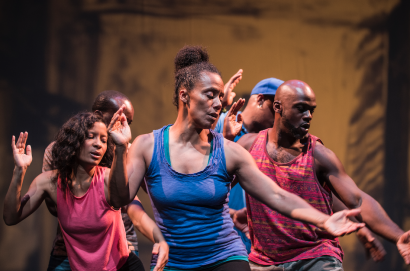 Marc Bamuthi Joseph on his latest performance art piece, "/peh-LO-tah/"
Marc Bamuthi Joseph is Chief of Program and Pedagogy at Yerba Buena Center for the Arts. He is an inaugural recipient of the United States Artists Rockefeller Fellowship, the winner of the 2011 Alpert Award in Theater, and an inaugural recipient of the Doris Duke Performing Artist Award. He is the founding Program Director of the exemplary non-profit Youth Speaks, and is a co-founder of Life is Living, a national series of one-day festivals designed to activate under-resourced parks through hip-hop arts and focused environmental action. 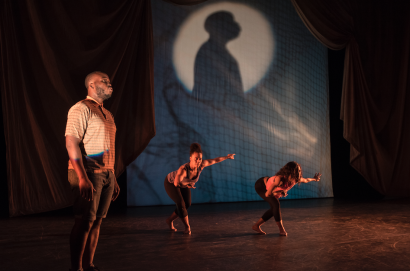 Mr. Joseph recently premiered the Creative Time commission “Black Joy in the Hour of Chaos” in New York’s Central Park, and is currently completing a new work with Bill T. Jones for the Philadelphia Opera. His evening-length piece “/peh-LO-tah/” has been commissioned by the Kennedy Center and the Guggenheim Museum and will premiere at YBCA in November of 2016. Read our interview with Marc below. We discussed his passions around art and education, how his Haitian roots influence his work, and the politics of freedom. Blavity: Tell us about the early stages of your career, what brought you to this work? Marc Bamuthi Joseph: The thing that probably led me to this path is hip-hop culture. I was born in 1975 in NYC and was very much inspired by not just the music, but the politics of the time. The divestment movement in South Africa, the police terrorism in New York, before Amadou Diallo, these kinds of critical moments in our racial justice trajectory. And then I was coming up in a culture system that was speaking back to that and using culture as a means of mobilizing and organizing. Also because I am from Haitian heritage, I’m of a people who have revolt inscribed in their history. But also, that have kind of a spiritual and folkloric tradition that is able to find joy through struggle. So all of these things were present in my life. Hip-hop, Haiti and a certain political ethic. I was able to use the tools I had at my disposal, to articulate responses to all of these things that were happening in my world and part of my cultural heritage. I went to Morehouse, and was further politicized going to an HBCU. I left school and became an educator and a co-founder of a spoken word organization for young people called Youth Speaks. And subsequently, an international poetry festival called Brave New Voices. So taking hip-hop and folkloric traditions, a certain political ethic, and applying that to educational theory and educational platforms through spoken word and the theatre background I have. I was on Broadway as a kid, and I did theater all throughout my youth. Taking all of these things, the politics, the cultural landscape and having these skills in the performing arts, I put them all together and forged a career predicated on political and educational accountability. [I used] The performing arts as an instrument to galvanize people and to ask critical questions and hip-hop culture as a way of thinking in terms of hybridity and in a multi-disciplinary way and in a way that’s also joyful. And that’s how it continues to come together. MBJ: I’m a child of immigrants, I’ve been playing the sport of soccer for as long as I can remember. One of my earliest memories was at a soccer stadium. When I think about some of the most joyful experiences in my body, they’re connected to the sport. I think also because I have a political lens and a geopolitical lens, I do recognize soccer is one of the few things the entire world can agree upon. It’s the planet’s most popular sport. Its kind of like Love, Religion and Soccer are the only things the planet can do together. I was fascinated beginning in 2009, I was in South Africa and South Africa was about to host the World Cup. There was this massive amount of investment being poured into the country on a corporate level to prepare the country for visitors from all over the world. Now the thing is there was investment in stadiums, or hotels, certain roads that led to the stadium, the improvements to airports. But there wasn’t as much investment being made in the people who historically had been on the wrong end of the apartheid system. Not just from a place of social justice, but from a place of economics. That same amount of investment wasn’t being made in water distribution systems, or education systems, political rights systems, in the townships. So what I was tripping on, is that this thing that brings the world together, in some kind of perverse way is reinforcing some of the economic legacy of apartheid. So I was really fascinated by that tension of global joy and also the global pathologies that are inherent in a capitalist system. So that was really the genesis of the investigation in the years since as the ideas have matured. Beginning in 2013 as the Black Lives Matter and the Black Liberation Movement began to have increased visibility, the tie between the freedom that I feel in my body when I play this game and this notion of political freedom, or this notion of "the opposite of freedom isn’t slavery, the opposite of freedom is perpetual fear." Here’s this sport that makes me free, but here’s my black body's existence that is brought with this feeling of, "I need my 14 year old son to get home to me." Actually right now, we are at a Know Your Rights campaign that Colin Kaepernick is putting on. I’m standing outside while my 14-year-old is in workshops right now, he’s in there with 150 youth, boys and girls. So here’s this sport that gives me this sense of joy but here we are living in times where athletes that speak out against these personal freedoms are vilified. So what “/peh-LO-tah/” has become is a theatre piece heavily based in spoken word and dance and film that explores these tensions between the matter of black life, the joy in the body when playing this game on a global level and the various economic and political opposition that we face systemically, that we face in terms of expressing freedoms and joys. The piece as it's emerging is both a thing that explores sports but also explores sport as a conduit to black joy in the face of political and systemic opposition. Blavity: What I love about the description of "/pe-LO-tah/" is how interdisciplinary it is. You approach these issues with great nuance, which is very refreshing. Tell us more about why its important to look at issues through multiple lenses. MBJ: When I left school, I became an educator. I’ve worked with probably thousands of students at this point. My graduate degree is in education, my wife is a kindergarten teacher, her graduate degree is also in education. My grandmother was a teacher, so education is very important and integral in terms of my personal biography. And what you learn in the classroom is that lectures are much less effective than what I call “energetic reciprocity,” a way of dialogue that honors the knowledge that the young people bring into the space. But really just the value of all the knowledge that anyone has in any conversation. To question, "how do we maximize everyone’s value in the educational space in service of the broader desire to uplift us all? I think about theatre in much the same way. The more ways we come at a question and the more questions that you can raise without providing prescriptive answers, the more inviting, truistic and uplifting the space becomes. Less in terms of audience but more in terms of pop-up communities. So my relationship as a performer to the people watching is really to facilitate the community experience, and the poems that we perform or the dances that we perform, these are different ways to engage different senses in service of a broader goal. By abstracting information through the body, the person watching gets a different sense of the allegorical context of what’s being spoken. So the multi-disciplinary approach is also part of a strategy to create multiple points of access into the same dialogue. Over time, about 15 years I’ve been working this way, its been proven to be really effective and welcoming to folks. Whether its been in an intimate workshop or on stage at the Kennedy Center. In terms of themes, so many people watch sports, and there is so much allegory in the athletic field. Sports are metaphors of ourselves and our society, as I said with Kaepernick, mainstream media doesn’t want our athletes to take a political stance. Even though you can have neo-Nazis in the crowd at a game, you might have really heightened political tensions, there’s politics being played out all over the place. Many years ago, sports brought the country of the Ivory Coast unified around their World Cup team. Politics are present in sports. One of the things about “/peh-LO-tah/” is we can use sports to have another perspective on politics in a way that is kaleidoscopic. It gives you multiple perspectives through sports, which on its surface is engaging in a much more innocuous way. So we are able to begin powerful political perspectives through this broad language of global sports. Blavity: Let's return to the idea of sports leading to finding freedom in your body. What are your thoughts on how sports can be both freeing but also exploitative? MBJ: When I think about this idea of freedom, I think, "What’s the freedom Mandela fought for? What did Thomas Jefferson think about freedom?" All of these are law based, but when I think about freedom, its more than politics, its a kind of thing that you can’t quite capture that’s really not about your body at all, its about being able to exist unencumbered from your body. When I think about the places in my life and in my body when I feel most free it's in dancing, being at a house party and listening to Prince, or singing the hook to a Stevie Wonder song, when I’m in the music, when I’m in the dance, that’s when I feel free. I think about 5-year-olds running, just running and they don’t care where. When you can barely feel your body, that to me is freedom. And that’s what athletes feel. Its both physiological and psychological. So I think many athletes who work in rigorous ways in order to achieve a body memory that enables them to access that spiritual psychological and physical high, to be able to perform the highest level of your body. That’s why freedom exists in the athletes work. They also have tremendous visibility and many of us watch them in order to vicariously experience freedom through their actions, their joy, when a football player scores a touchdown, when you watch sprinters and you can see joy exploding on their faces when they cross the finish line, and all this work has culminated in this moment. We can experience joy through watching them. We don’t want to have that complicated in any way. Its harder for me to watch a Mark Wahlberg or Bruce Willis film, because I know they are conservative actors. So we don’t want that vicarious feeling of joy mitigated by any knowledge of political perspective. So I think it continues to be complicated because what we want is a fix from our athletes but they don’t exist out of context. Athletes are in a tough position because if you’re an important athlete, you can’t stop being you, Allen Iverson couldn’t stop being him, the politics in his body are impossible to ignore. It’s interesting to watch this play out on our media landscape. Our athletes are doing all they can to use their bodies as conduits for joy and freedom, but they cannot escape their political realities and that millions are watching them in excitation that they’ll use their platforms to do more than express freedom, they’re also expected to be spokespeople on behalf of millions of folks that could use their platform in order to undo systemic oppression. That’s why art is important, because art can take these complicated issues and not provide answers but create tapestries that are accessible and hella beautiful. Art gives us a canvas that we can paint a collective picture on, a collective mosaic of the politics of freedom and joy all in play on one stage. Blavity: How has your Haitian identity influenced your views on global oppression and art? MBJ: The last time I went back to Haiti was this past February, with 10 family members. The thing abut Haiti, we just saw the tragedy of Hurricane Matthew. Haiti is the poorest country in the Western hemisphere. The only way you can truly understand capitalism is being at the bottom of the economic ladder. That in order to have wealth you must have poverty. In order to have black marginalization you have to have white supremacy. Being in Haiti, what you experience is a true sense of the plight of our quality of life here in the United States. One of the reasons why our quality of life is amazing is because we don’t live in a fully equitable global society. And it's not horizontal, it's top down. There's a level of ancestral accountability that I have, not just to Haitian people but to the underclass that our economic system has created. To do whatever I can to add voices to how these systems work. And what the direct result of these systems is in terms of our broad support. On the other side, on the cultural side, Haiti is a place of magical cultural expression. From painting to woodworking to dance to spiritual art. There is a kind of resilience and broad history of using political turmoil as inspiration for cultural expression and innovation that you see not just in Haiti but throughout the African Diaspora and in African America. There are multiple things going on, it's also that I'm Haitian in the United States, and African America has a similar tradition of cultural innovation born out of political loss or economic loss. So I make work out of those traditions as well. Blavity: Lets talk more about beyond the show efforts you carry out to ensure communities are effectively engaging with the work. MBJ: We have what we call a political education sports workshop that we do called Moving and Passing. And we’ve done this in NYC, D.C. and ATL. We do a one-day sports workshop for kids that are primarily immigrants or undocumented. We do this with somewhere between 200-400 kids, we are doing various soccer drills all day, but interspersed are moments of cultural expression. It might be a marching band, it might be a West African drum and dance ensemble, it might be a jazz band. There are these cultural moments that pop up during the course of the day, and we work with a political organization called Culture Strike, which focuses on redefining and positioning the immigrant identity as beautiful. They position immigration and migration as natural and beautiful as opposed to the way that its often seen as negative. So Moving and Passing is a way to work with immigrant kids that puts cultural expression and sports on the same continuum in an effort to position the strategies that you would have on the field as the same strategies you would use in navigating America. The kids come in and some of them will do a soccer drill for 20 minutes, others will be doing a soccer drill that’s actually choreography, but we don’t tell them they’re dancing, we tell them they’re doing agility drills. The day ends with them working with Cultural Strike so they can realign some of the themes they heard during the day, with their own lives as Americans. We follow this up with soccer clubs these kids have joined. For example in New York we continue to work with South Bronx United, our main partner there, to go into the classrooms, to use the text from“/peh-LO-tah/” to have a six- or seven-step curriculum, where they can remember this day, and utilize that when they think about their own identity. 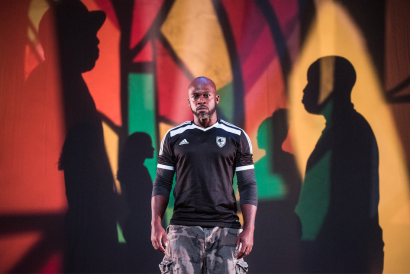 Education is super important to me, so as we are performing for audiences all over the country, there are also partnerships that we make with local soccer clubs that are serving youths of color, particularly young immigrants, so they can understand what the show is trying to resolve.